In my previous post I discussed how I came to be interested in probabilities, after having spent about a decade (which refers to a period of time of 10 years, and is not in any way associated with decadence… O_O (12’20”) ) making use of tools that assumed or did some calculations with probabilities. I mentioned it because it was interesting for me to realise what had made me care about it and seek out to learn more and because it might be interesting for other people. Who knows, may be you are struggling to find the motivation or interest in the topic necessary to really dig down into it, like I did. In that case may be going through those same things will help you find the focus you need. Nevertheless, I came across some interesting facts about autocrats and their regime. As it turns out it’s a pretty accidental lifestyle, characterised by an exponential distribution. But more importantly: Why and to what effect? The point is, last week I was looking at the crisis of the third century how the empire survived it, whereas it collapsed in the late 400s and I decided to count the number of emperors during the crisis of the third century and compare it with the number of emperors during the Principate. I was doing it for kicks, so I just went on wikipedia and got the years for the beginning of the reign of each emperor. Nothing too formal, but hopefully informative enough. As it turns out you can see the chaos in the figures. So then, just out of curiosity I decided to calculate the duration of the reign of all the emperors up to Carinus, which was the last emperor of the Crisis of the third century (the Dominate, the next period is generally considered to have begun with Emperor Diocletian in 284). And that’s when I realised it: I suddenly found myself holding on to a distribution of reign durations for the first 3 centuries of the Roman Empire. 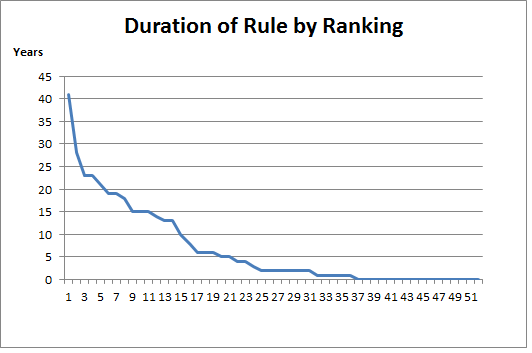 After staring at the data for a while, I realised I could organise the data and get a ranking of the duration of the rule of the different emperors. Rearranging it, I was suddenly looking at an exponential distribution. 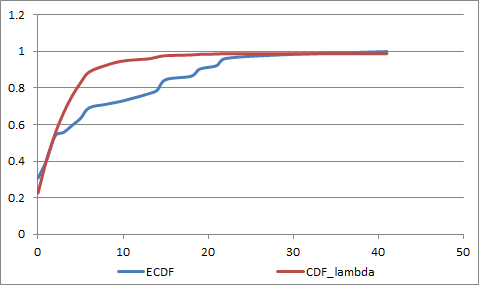 Based on this, I could calculate an Empirical CDF curve and from that I could try to figure out what the theoretical CDF would be. Literally, you can do any and all of this with MS Excel… all you need is the data and you can calculate the parameter of the theoretical pdfs, lambda. 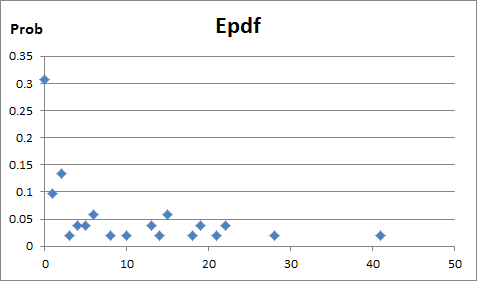 With that, the data and the formula for an exponential distribution you can then calculate the theoretical CDF. My data was not very detailed so I ended up with quite the gap between the two, although after some testing I ended up showing that it is an exponential distribution. Which is nice because people with better data and more sophisticated methods came to the same conclusion. “Statisticians know very well that if in a course of time some events, like emissions of radioactive particles, traffic accidents, occurrence of abnormally high prices on stable markets, etc., take place at random moments and if the random times elapsing between them have exponential distribution then these events occur purely at random, in an unexpected, unprepared and unpredictable way. Unconvinced, the authors postulate that a simpler reason might be that Emperors tended to be old by the time they reached power, in which case they just died of natural causes due to advanced age, which they argue would be difficult to distinguish from an exponential distribution. The resulting situation would imply different hypotheses. In the first “accidental case”, it should lead to a decrease in the emperors’ life span after gaining power, whereas this should not be the if it is just a natural cause. If the second hypothesis is correct, then the distribution of the duration of the rule of young emperors should be different from the one of young emperors. However, they don’t find a statistically significant difference between the distribution for young and old emperors, implying that indeed the distribution is exponential. But what’s the use in this? – What do I get out of realising that the distribution of the duration of the reign of different Roman emperors follows an exponential function? First, it is interesting to notice tat this conclusion holds for Chinese Emperors, Russian Tsars, British Rulers and Spanish kings. It just seems to be a rule for that type of political system that the duration of the leaders’ rules seems to be characterised by random-like accidents, crises or revolts that are unpredictable according to statistics. A second interesting fact is that we can compare the fit of the exponential distribution in different places and relating to different empires. For example, KBH(2005) show that including Russian Tsars going back to Ivan the terrible made for a better match between the data and an exponential distribution. They also noted that while the exponential hypothesis also held for the UK there was a slight bigger difference between young and new rulers than in the case of Rome, although the limited size of their sample was problematic. Another thing we can do is compare the parameters of each exponential distribution. In both cases, this would yield a measure of how accidental the rules were. A third insight is that the probability and potentially the entropy that can be derived therein probably also offers an interesting metric to compare different political systems, be they democratic, autocratic, oligarchic, or bureaucratic. A fourth, interesting issue is concerned with the cause behind such distributions. Why is the distribution shaped that way? What are these accidents that absolute rulers have? Why do they have them? Why are they not better protected as the authors had expected? Also – What are the political and economic implications, considering such regimes disorderly processes of succession and the implied uncertainty underlying economic activity in such regimes? Clearly there’s a lot of things we could learn. Above, I just highlighted 5 quite basic and interesting things I wasn’t taught in political analysis, political economy or political theory. Now let me see how I can explore them a bit further….